Yeezus walks ... away from a multimillion dollar partnership offer from Apple. 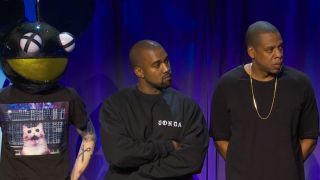 That's what Kanye West, known as much for his antics as he is for his rhymes, casually dropped at a lunch in the presence of T Magazine's Jon Caramanica. During what sounds like one of the rapper's signature monologues, West revealed he passed on "a multimillion dollar partnership" with the iPhone maker. Amazingly, he didn't cough up a clue as to what the team-up would have entailed. Could he have been a fashion consultant on the Apple Watch? Was it a plot to pull a Beyoncé? An offer to help take on Tidal? Yeezy was there when buddy Jay-Z relaunched the music service, so he'd have good reason to turn down the big A, if only not to anger Bey. Unfortunately, we'll never know what could have been between Apple and Kanye, if he is in fact speaking the truth. Remember, the guy likes to talk.